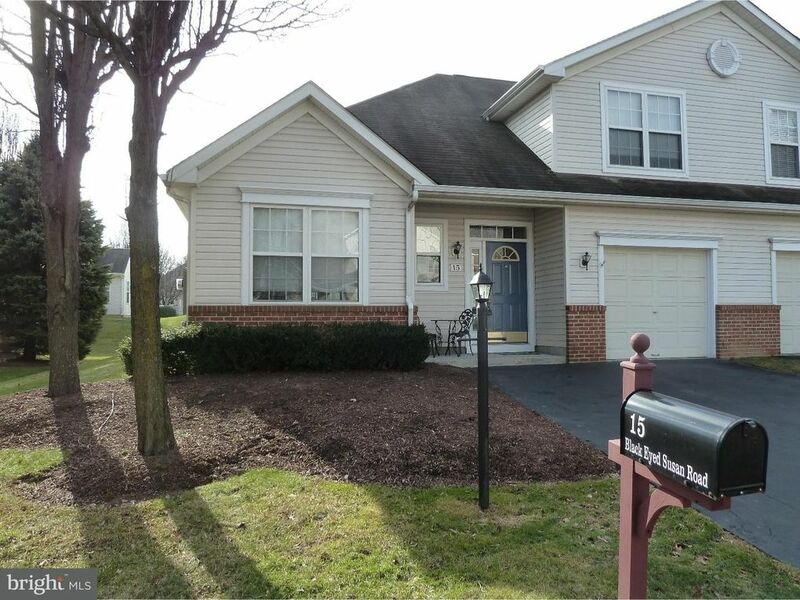 Wonderful affordable opportunity to live in Bucks County highly desired active 55 Plus community of the Villages of Flowers Mill. This twin homes has all the essentials. Enter from a covered porch into a dramatic 2-story foyer with hardwood floor. Ahead is a Living / Dining Room with cathedral and vaulted ceilings, cozy electric fireplace with mantel, and French doors to the rear patio with retractable awning. The generously-sized island kitchen offers abundant cabinetry and counter-space, pantry, sun-drenched breakfast area, and lots of recessed lights. Appliances include a GE gas range with self-clean oven, GE built-in microwave oven, GE dishwasher, and Kenmore side-by-side refrigerator with exterior water/ice dispenser. The main bedroom overlooks the rear yard and offers a walk-in closet, single closet, linen closet, lighted ceiling fan, and private bath with shower. A hallway leads to a tiled powder room with pedestal sink, closeted laundry, and garage access. Ascent the open stairway to a landing overlooking both the foyer and greatroom. The 2nd bedroom has a double closet and private full bath with tub. A storage/utility room completes the upstairs. Enjoy relaxing and barbequing on the expanded patio a comfortable distance to your neighbors. Meet friends at the awesome 2-story clubhouse boasting indoor and outdoor pools, fully-equipped fitness center, ballroom, game rooms, hobby/craft room, clay-court tennis, and a myriad of activities. Come enjoy the good life!